IMAGE ABOVE: Catalina Alexandra, Candace Rattliff and Brit Wallis of Hope Stone Dance Company dancing at the CAMH. Photo by Martin Yaptangco. Every year, I resist the list, and then cave with some kind of listicle of fave performances. 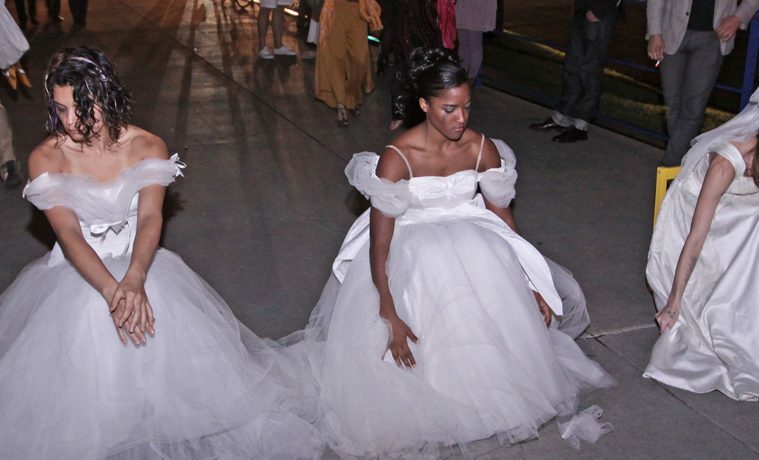 Here are some moments that stood out for me on Houston’s dance and theater stages. Oh, and one film performance, because I couldn’t resist. Mireille Hassenboeher in Houston Ballet’s production of The Merry Widow. 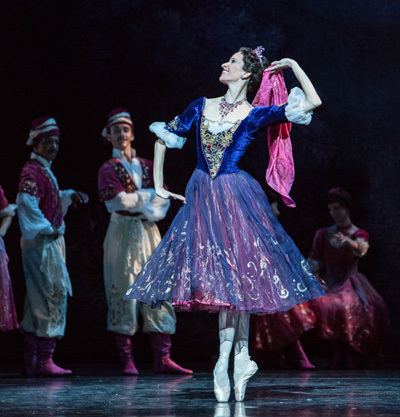 Houston Ballet principal Mireille Hassenboehler’s retirement hit ballet lovers hard. It seemed sudden. Luckily, she gave us one last chance to cherish her leggy wonder in her elegant final performance in The Merry Widow. During her final waltz she seemed to fully surrender, leaning into the full splendor of her stellar career. 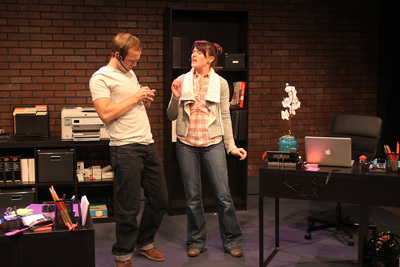 Adam Gibbs and Rebekah Stevens Gibbs in Black Lab Theatre Company’s production of Assistance. Adam Gibbs and Rebekah Stevens Gibbs rocked in Black Lab’s production of Assistance. OK, so they are married in real life. Still, their flirty banter felt fresh and full of wit and sizzle. 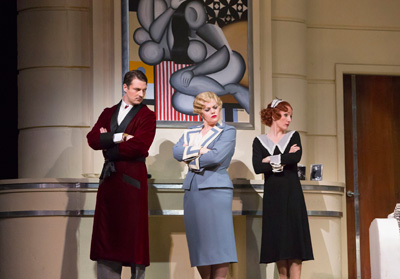 Liam Bonner, Wendy Bryn Harmer and Laura Claycomb in Houston Grand Opera’s production of Die Fledermaus. Perhaps baritone Liam Bonner came out of the womb sporting a red velvet smoking jacket. All swagger and charm, with a velvety voice, Bonner delivered a pitch perfect performance as Eisenstein in the Houston Grand Opera production of Die Fledermaus. 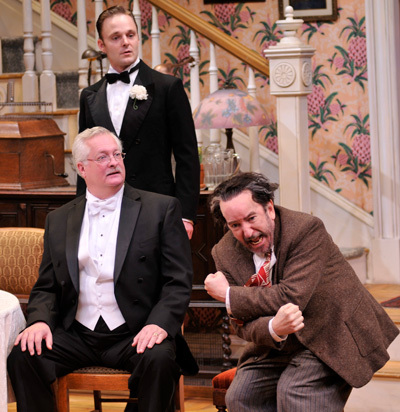 Paul Hope as Mr. Kirby, Jay Sullivan as Tony Kirby and John Tyson as Boris Kolenkhov in the Alley Theatre’s production of You Can’t Take It With You. Photo by Jann Whaley. John Tyson as Boris Kolenkhov, the looney tunes Russian ballet teacher in the Alley Theatre’s production of You Can’t Take It With You, just cracked me up. Tyson’s shenanigans brought out the laughs in this much cherished chestnut. 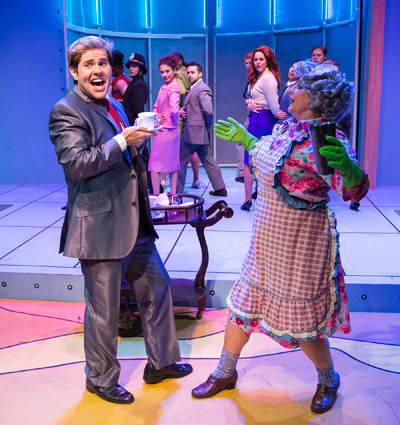 Dayne Lathrop as Shame’es Blond and Genevieve Allenbury as Mrs. T in Panto Goldilocks at Stages Repertory Theatre. Making his Stages Repertory Theatre debut, Dayne Lathrop was just downright adorable as Shame’es Blond in Panto Goldilocks. Not only does this devilishly handsome actor rock a baby blue terry cloth onesie, he can sing too! Watch out for this young Sam Houston State grad. Hope Stone Dancers Michele Kitchen, Shohei Iwahama, Amaris Sharratt performing at the CAMH. It was a regular Hope Stone Dance Company infestation with three pieces happening at once during the opening of CAMH’s Outside the Lines. The weeping zombie brides dropped right out of a Pina Bausch dream, while the music box ballerinas danced up a weird and wonderful storm. Meanwhile, Hope Stone II frolicked in and around the fountain. 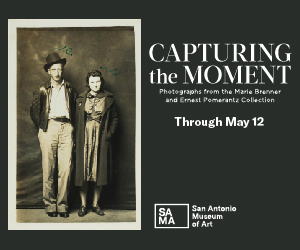 Dancing in museums has been a trend for the past two decades, so I’m glad to see it making its way to Houston. I suspect CAMH chief Bill Arning to be a dancer lover at heart. 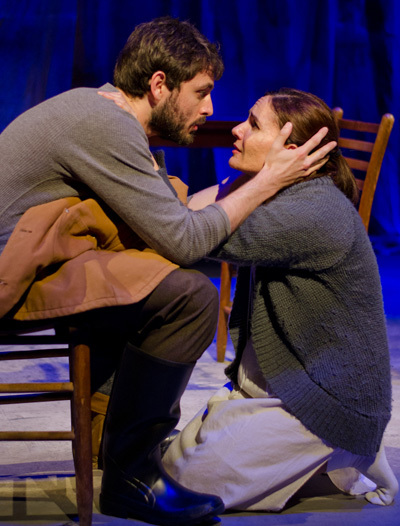 Bobby Haworth and Patricia Duran in the Mildred Umbrella’s production of Foxfinder. Photo by Gentle Bear Photography. Mildred’s Umbrella Theatre Company’s production of Dawn King’s Foxfinder gave me nightmares. It was that menacing. Directed by Matt Huff with a fantastic cast that included Bobby Haworth, Patricia Duran, Kevin Lusignolo and Michelle Edwards, Foxfinder was one of the most fully realized MU productions. Greg Dean’s bare bones set amplified the creepiness. Stephen Petronio Company in Underland. Photo by Sarah Silver. Some of the fieriest dancing of 2013 came from Stephen Petronio Company in Underland, a post collapse dancescape set to Nick Cave’s dark tunes. Presented by Society for the Performing Arts, Underland proved a rare opportunity to discover Petronio’s spectacularly rugged choreographic handiwork. Houston Ballet’s Connor Walsh and Lauren Strongin in Stanton Welch’s Sons de L’âme. Photo by Sébastien Mathé. Stanton Welch’s Sons de L’âme (Sounds of the Soul) proved what I always suspected, that the Houston Ballet chief is a master of the pas de deux form. Lauren Strongin and Connor Walsh were especially nuanced in their section. The ballet, originally performed with pianist Lang Lang, had its world premiere at the Theatre des Champs Elysees in Paris last October, but we had a chance to see an excerpt at Houston Ballet’s annual Jubilee of Dance. 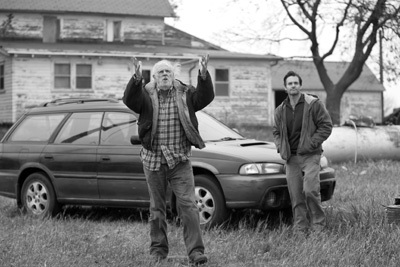 Bruce Dern and Will Forte in Nebraska. It’s true, I have zero cred when it comes to film criticism. But as someone who was recently handed the senior menu at Denny’s, I have a thing to say about old people, who rarely seen on stage or screen. Bruce Dern’s outstanding performance in Alexander Payne’s Nebraska should garner all kinds of shiny statues. Kudos to Houston Cinema Arts Festival for bringing the film along with Will Forte to town. 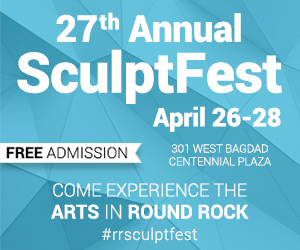 Nancy Wozny is editor in chief at Arts and Culture Texas, a contributing editor at Dance Magazine and a frequent contributor to Pointe Magazine and Dance Teacher.